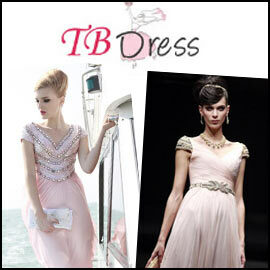 If you're on the hunt for a modest light pink prom dress or evening gown, you'll find some at the TB Dress website. During our visit to the site, we saw a flowing v-neckline, floor-length dress with short sleeves, an a-line empire dress, and other styles that you might find appealing. The listed prices were quite inexpensive at the time of our visit, and we have seen some criticism of this company on another website. If you like a dress that you see on this site, we recommend ordering well in advance of your event, so that you can inspect the item, and possibly reinforce some of the seams.